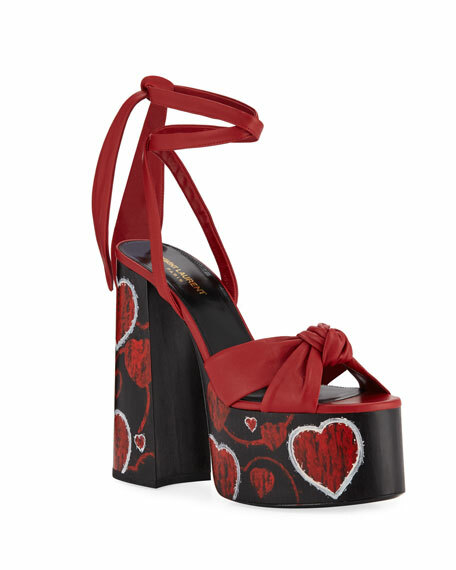 Saint Laurent leather sandals with heart-print detail at base. 5.8" block heel with high platform. Knotted straps band open toe. "Paige" is made in Italy. Fit note: Saint Laurent shoes run small. Please order a 1/2 size larger than you typically wear. Founded in 1961, Yves Saint Laurent was the first couture house to introduce, in 1966, the concept of luxury prêt-à-porter with a collection called "Saint Laurent Rive Gauche," synonymous with youth and freedom. This shift represented a first critical step in the modernization of fashion and revolutionized the socio-cultural landscape. Throughout the years, the House's groundbreaking styles have become iconic cultural and artistic references, and its founder, the couturier Yves Saint Laurent, secured a reputation as one of the twentieth century's foremost designers. Part of the Kering Group, the House kept true to its identity of absolute modernity and fashion authority. Under the creative direction of Anthony Vaccarello, appointed in April 2016, the House offers today a broad range of women's and men's ready-to-wear products, leather goods, shoes, jewelry and eyewear. Through a license agreement, it is also a major force in fragrances and cosmetics. Loeffler Randall mule in kid suede. 3.5" covered block heel. Open toe. Knotted detail. Slide style. Leather lining and sole. Loeffler Randall mule in kid suede. 3.5" covered block heel. Open toe. Knotted detail. Slide style. Leather lining and sole. "Laurel" is made in Brazil. Fit note: The Laurel runs slightly narrow in the toe. We suggest ordering a half size up for added comfort. Sesto Meucci "Ellia" comfort sandal in soft, laser-cut leather. 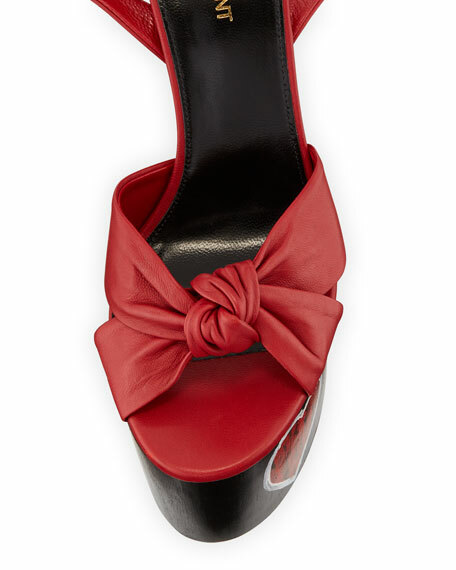 Grip-strap slingback ensures a great fit. 1" flat demi-wedge heel. Cushioned insole. Flexible rubber sole. Made in Italy. Sesto Meucci "Emelia" sandals in soft, laser-cut metallic leather. Back zip for easy on/off. 1" demi-wedge heel. Soft, flexible rubber sole. Made in Italy. Sesto Meucci "Evie" sandal in cinzano laser-cut calf leather with stretch goring. 1" demi-wedge heel. Back zip for easy on/off. Sesto Meucci "Evie" sandal in cinzano laser-cut calf leather with stretch goring. 1" demi-wedge heel. Back zip for easy on/off. Leather lining. Padded insole. Soft, flexible rubber outsole. Made in Italy.